SPE News: RevoZport Tesla Model S "R-Zentric"
One of the leading brands in minuscule aftermarket automotive exterior/interior parts has brought a little more life to the Tesla Model S’. 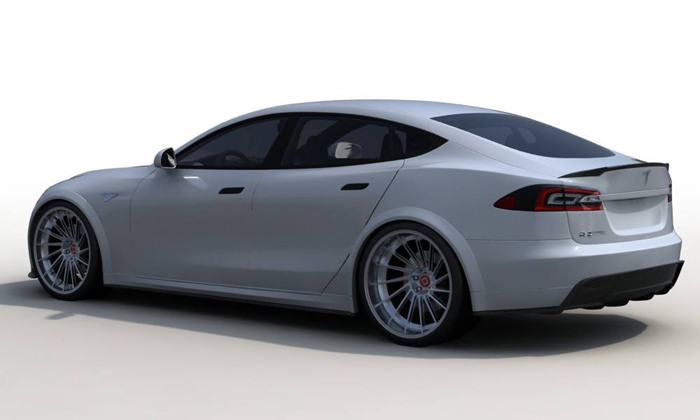 With the help of RevoZport’s design and R&D team, your Tesla Model S can now mean something more than just a fast electric car. RevoZport’s vision was to focus on giving the Model S more downforce and a wider track-width to compliment the cars performance for better handling and grip. Because of Tesla’s fancy electronics and 17″ touchscreen display, RevoZport decided to not only improve downforce and handling, but to add more ‘tech’ to the interior as well. They’ve come up with a rear entertainment console which would be very cool to have for both kids and adults on those long drives. Please contact david@sp-power.com for more info.